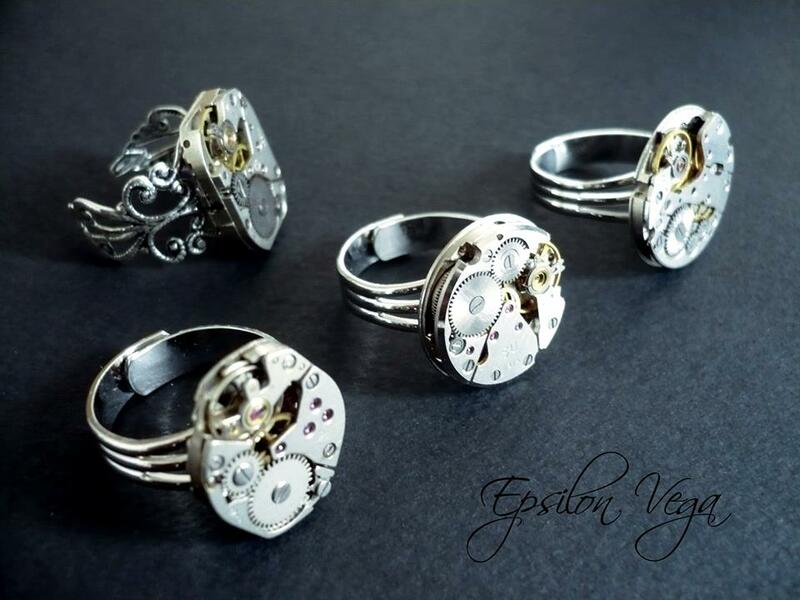 Epsilon Vega gives a second life to old mechanical watches and antiques by transforming them into high quality jewelry. Epsilon Vega was created by a young French couple of artisans who work with old watch parts. Epsilon Vega gives a second life to old mechanical watches and antiques by transforming them into high quality jewelry. All the jewelry are handmade in Lyon, France. Epsilon Vega likes fairy tales as Alice in Wonderland or Peter Pan or Jules Verne, Edgar Poe. They like looking for antiques and dismantling, sanding, welding, assembling, ascending… It’s this mixture that inspires them to create original pieces. They have developed their own technique and makes not only necklaces, bangles and rings but also cuff-links or hair accessories. Lots of pieces are unique. Sophie is the one behind each unique creation.